This is a small, soft-backed, pocket book of just over 160 pages. Its aim is to provide a quick entry into the subject and act as an aide memoir for those faced with assessing a patient with ultrasound in an acute situation. Simple drawings are used to show probe position and example ultrasound images are provided. These images are taken from the type of relatively cheap portable ultrasound machine that is likely to be present in the emergency department. There are useful tips and handy hints on how to answer the binary question posed. Importantly, the book tells the reader what ultrasound can and cannot tell you in each scenario, and goes onto say what to do next. The book has well-structured headings enabling easy reference. It has a friendly style and is not in the least intimidating. I would encourage radiologists to make sure that those using ultrasound in this way are taught appropriate skills and know their limitations. This book is a good place for them to start. I like the final quote given, "a fool with a stethoscope will still be a fool with an ultrasound." I strongly urge each practitioner to buy a copy. 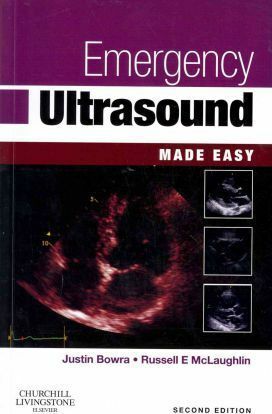 ?This is a very succinct, well-illustrated book, which is sharply clinically focused, and would be of considerable use to those who work in the emergency department and have an interest in adding diagnostic ultrasound to their clinical skills.